You may know that customer reviews are a big factor in how your business ranks in the Google Places local search results. And I’m sure you know reviews are crucial for winning more customers—who often make buying decisions based largely on which local business has the best reviews. —How likely you are to rank in the top-3 if you have the most reviews in your local market? —How many reviews will you likely need if you want your business to rank on page one of Google Places? —How many reviews does the average #1 business have? But you couldn’t just poke around online and find the answers to these questions. Sure, there’s a decent amount of general info about customer reviews and their role in Google Places, but I wasn’t able to find a satisfying amount of real numbers or specifics. I rolled up my sleeves and looked at 1000 local markets in Google Places. I saw 7000 different businesses in all 50 states, and a grand total of 181,718 reviews between them. My goal? To get some concrete facts about the relationship between reviews and top rankings in Google Places. It took me a while, but I finally got some facts. The numbers confirmed some things I’d suspected for a long time, but also overturned some assumptions I’d been operating under. If you’d like more facts than you have today and want a better sense of exactly how many reviews you’ll need to rank more visibly in your local market, read on. About 26. The average business on the first page of Google’s local search results has 25.9 reviews, based on my calculations. As you’d expect, the numbers vary widely from this average: some #1’s have just a couple reviews, whereas some businesses ranked #7 have a couple hundred. But after looking at 7000 businesses in 1000 local markets, I can tell you that if you get 26 customer reviews there’s a good likelihood you’ll get on the first page. 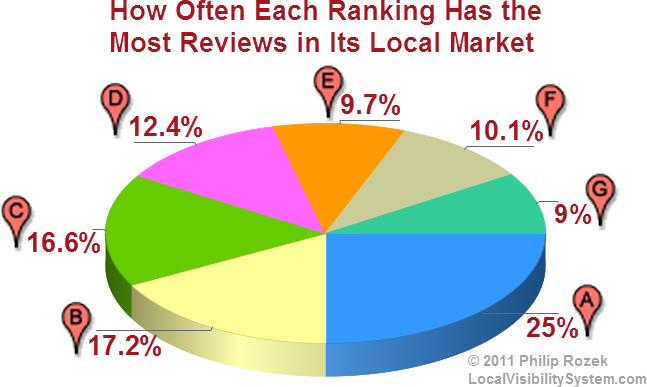 In other words, which position most frequently had the most reviews in its local market? The answer is A: 25% of the time the top local ranking (A) had the most reviews. Of the 1000 local markets, B had the most reviews 160 times, whereas C had the most reviews 154 times. So for all intents and purposes, B and C are tied: each one has the most reviews about 17% of the time. 34% of the time, either B or C has the most reviews. End result: in any given market, there’s a 59% chance that one of the top 3 rankings (A, B, or C) will also be the one with the most reviews in that market. Therefore, if YOU have the most reviews in your market, there’s about a 60% probability that you’ll rank in the top 3 in Google Places. Note: there were a total of 71 “ties,” in which two or more businesses were tied for the greatest number of reviews in their local market. In most of these cases several businesses had one review and the rest had zero. Because each ranking had similar numbers of “ties” (ranging from 22 to 31) with other rankings, I didn’t include these relatively unusual markets when calculating how often each ranking has the most reviews. As you can see, A and B aren’t far behind. If I looked at 10,000 local markets (rather than 1000), maybe A or B would have had the most reviews. Either way, the top 3 rankings all have roughly the same share of reviews, in terms of volume. The key thing to keep in mind is that there’s a significant gap between the top 3 rankings and the lower 4. A-C had a combined total of 97,619, whereas D-G had a combined 84,099. The top 3 have more than the next 4 put together. That’s a big gap. The bad news is the bar is pretty high to get into that A-C range. The good news is if you’re in the top 3 in terms of reviews, there’s a good chance your rank will float into A-C rankings in Google Places. My estimate is you’ll need about one-and-a-half times as many reviews as your competitors have on average. In exact numbers, the average business that ranks A-C has 33 reviews. The average business that ranks D-G (#4-7) has 21 reviews. You’ll have to outstrip those lower-4 guys by about 50%. I assume you’d like to rank #1 in Google Places. The average “A” ranking has 33 reviews. 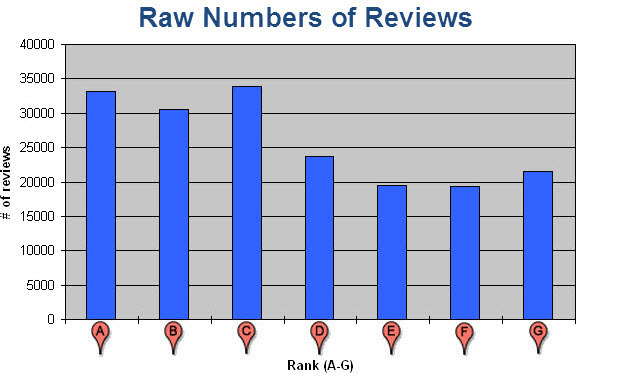 The average B-G (#2-7) business has 25 reviews. 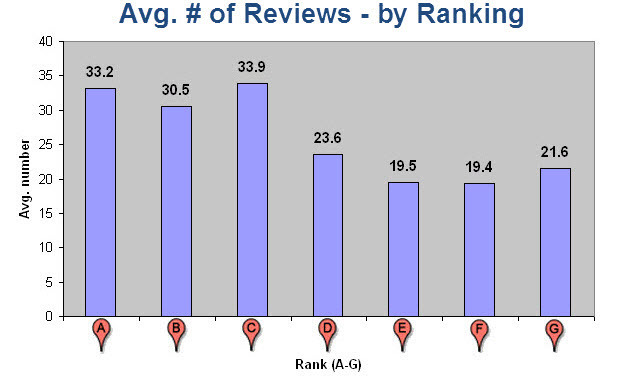 Therefore, the average #1 business has about 33% more reviews than the 6 competitors right below him have on average. Here’s what I suggest you do: figure out the average number of reviews that the top 7 businesses have. One-and-a-half times that number is what you should shoot for if you’re trying to outrank the local competition. —There’s a big difference between ranks A-C and ranks D-G. The top 3 have more reviews than the next 4 combined. The average top-3 business in Google Places has 50% more reviews than the average business ranked 4-7. Plus, 60% of the time the business with the most reviews in its local Google Places market is ranked in the top 3. You need a method for asking your existing customers for reviews. Maybe you have one already. I show you ways to do this in my free guide. If you don’t have it, download it. If you have it, apply the steps. You need a specific goal number, at least at first. How? Look at the local businesses that show up on the 1st page of Google Places (maybe you’re one of them), and figure out the average number of reviews those 7 businesses have. Have that number be your first goal, and then 1.5x that number be your next goal. Keep the reviews coming. Don’t stop at the “finish line.” Your ranking probably won’t go up the day you hit your goal number of reviews. You have to get ahead of your competitors in reviews and stay that way. Google doesn’t like sudden changes, but it does reward long-term effort directed toward things like drumming up reviews: it shows that you’re trying to give potential customers as much information as possible from your existing customers. If you’re already following this basic approach, hats off to you. In that case, just keep doing what you’re doing. Theory 1: It’s possible that Google has run tests and concluded that spots A-C in Google Places get significantly more clicks. Therefore, it would make sense to make the standards relatively tough for businesses to get into the top 3, if it’s the case those positions get the lion’s share of the clicks and potential customers. Theory 2: The top 3 may get significantly more visibility, more customers, and therefore more customers who end up leaving reviews—a nice upward spiral. The greater numbers of reviews may just be a byproduct of having a better ranking due to other reasons. Theory 3: Google *may* be considering a 3-business layout for Google Places—in which only 3 local search results show up on the 1st page. They did a brief test of it in early June (which lasted only a few hours), and on the same day I wrote about these possible “3-pack” search results. The tough standards for getting into the top 3 and the *possibility* of 3-pack Google Places results may have something to do with each other. My humble study isn’t perfect. Also, even though it was pretty ambitious and I wanted to “bite off” as much as possible, I didn’t want it to be more than I could chew. I could have looked at even more markets. 1000 is good, but 2000 is even better. 10,000 is even better than that. Also, even though I examined probably 150 different industries and services, there are even more industries that are worth looking at. More data is always better. I didn’t look at markets outside the US. I’d like to at some point, but I don’t expect to discover that Google handles reviews differently outside the US. Sure, other countries may have less-dense local markets, where it may be a bit easier to rank in the top 7 in Google Places. But the algorithms are the algorithms, and I doubt that there’s a different one in the UK, another in Australia, others in Canada and Japan, and so on. The specific numbers may vary from country to country, but the basic behavior of reviews probably doesn’t. I didn’t examine the behavior of reviews written directly on businesses’ Google Places pages versus those written through sites like Yelp, JudysBook, etc. For instance, I don’t know what percentage of #1 rankings have Yelp reviews, nor do I know how many different sites a top 3 business has reviews on. Again, I’d like to delve into this at some point. Extreme numbers create too much noise in the data. For instance, in markets like Las Vegas hotels or casinos, the top 7 businesses listed in Google Places have an average of 2000-8000 reviews apiece. I’d have to look at these markets either exclusively or not at all, because the numbers of reviews in these markets are so far above average that they’d completely overshadow and outweigh the numbers for all the average markets I looked at. It’s for the same reason that I didn’t include a bunch of uncompetitive markets in which the top 7 businesses all have zero reviews. Many businesses in small towns have absolutely no reviews, except for the most-frequented businesses in these areas, like restaurants and hotels. Maybe if I included the businesses with 10k reviews and all the goose-eggs my numbers would be slightly different—but only slightly. The markets where the Google Places businesses have thousands of reviews or zero reviews are the exceptions, not the norm. I’m writing this for people who are in markets that are pretty competitive—but that aren’t bloodbaths like Vegas casinos or markets where you’ll rank well if you can fog a mirror. Maybe in another blog post I’ll look at the absolute extremes—but I wrote this one with average-to-tougher markets in mind. There are still plenty more questions I’d like to tackle. I’d like to do a “Part Two,” where I mine the data even further and dig even deeper. In the meantime, if you’d like to take a look at the raw data or play around with it yourself, you can download the Excel spreadsheet with the data on reviews. You can also ask me about my calculations and how I arrived at the specific numbers that I just showed you. What questions do you still have about Google Places reviews? Any observations about what I’ve found, or suggestions for what to look at next? Dash off a comment! Hey Phil, I must say that’s some HELL OF A DATA there! Great job! However, I think a very important point is missing there and it is where the reviews are coming from! I have also been examining reviews and I could say with almost 100% certainty that reviews by Google Users have almost no value in the rankings, and at the same time reviews on third-party websites are a really important ranking factor + I consider the velocity of reviews and diversity of websites, where the reviews are coming from, also very important factors, i.e. quantity is not the only one in the mix as you state in the end of the article. Anyway, I must say this is a very very decent job! Keep it up! Yeah, I’d definitely like to take a closer look at which reviews from which SITES (Google vs. IYPs) carry more influence. As I said in the post, that’s one of the stones I didn’t turn over in my analysis, but it’s something I’d like to look at soon. You’re right on the money in terms of wondering about velocity of reviews, diversity of sites, etc. Quantity *so far* seems to be the biggest factor, but the ones you mentioned are also crucial. I’d love to know your findings on this. Great job on collecting all this data. Does the review data includes counts from all review sites, or just Google reviews? It looks like the date of your study was before Google Places stopped displaying/counting 3rd party reviews, so I’m guessing it’s all review sites. Can you clarify? Thanks! Yeah, I did this a couple weeks before the big change in July. My numbers include third-party reviews and Google Places reviews…all of ’em. My findings wouldn’t really differ if I did this now; it’d just be a LOT harder to collect data! Hi Phil and thanks for the great info. Is there a maximum number of Places results that Google will show for any one particular search on page one..? Could there be nothing *but* Google Place results on page one for a search..that would be pretty cool. I believe the maximum number of Google Places local results that can show on page one is 7. In the case of the “blended” results, the Places results do hog some pretty good page-one real estate, whereas the 7-pack still allows room for 10 organic search results on the rest of the page. I was wondering if you have started a new study based on “Pigeon”? Nope. But this is an old post, so revisiting review numbers post-Pigeon might be interesting! Let me know if you do! I would love to see what has changed!